I was hoping to run the gegl from the command line (gegl.org/commandline.html) on Windows. I have GIMP 2.10.6 installed on Windows 10 but I can't find gegl.exe in the bin folder or anywhere else. Searched the internet with no luck. Any idea where I can find the command line tool for windows? Building from source looks like quite a chore. I do not compile anything in Windows but even in linux GEGL is a pita. No gegl.exe in Gimp 2.10 however It was there in earlier versions, a Partha 2.9.5 has the file. Not much use. I tried side loading missing dll files into the gegl folder, spent an hour chasing dependencies without luck. If you want to try stand-alone gegl you might be better off installing a linux in a virtualbox. 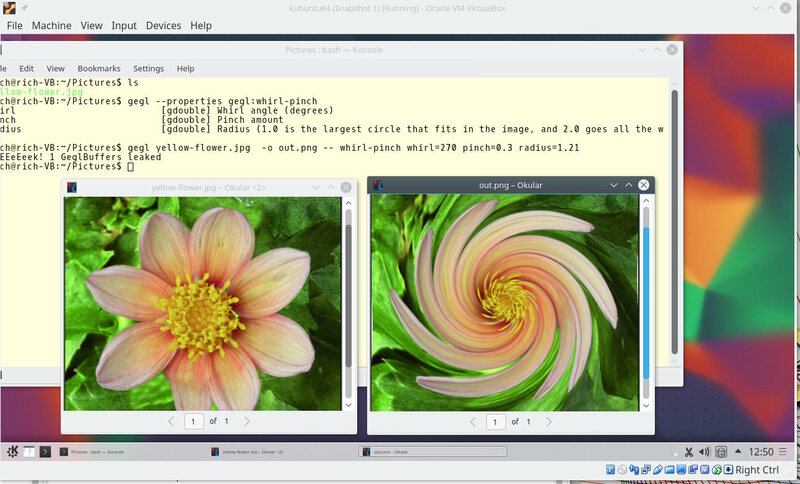 edit: an example in a Kubuntu 16.04 VirtualBox https://i.imgur.com/clACmNN.jpg using whirl-pinch with before / after images. (11-03-2018, 11:57 AM)rich2005 Wrote: If you want to try stand-alone gegl you might be better off installing a linux in a virtualbox. Thank you for the feedback. I have the gegl command line working under Virtualbox and Ubuntu 18.04. Amazing tool! It is just what I needed especially since GIMP scripting and gegl aren't playing nice at the moment. This may finally be the motivation I needed to make Linux my main OS.